253 Marlborough is located on the north side of Marlborough, between Exeter and Fairfield, with 251 Marlborough to the east and 255 Marlborough to the west. 253 Marlborough was designed by architect Carl Fehmer and built in 1883 by James Smith and Levi Whitney, builders, as the home of real estate broker James Freeman Curtis and his wife, Helen Read (Gardner) Curtis. He is shown as the owner on the original building permit application, dated April 24, 1883. They previously had lived at 258 Beacon. The house was completed and the Curtises had made it their home by the 1883-1884 winter season. However, they did not take title to the land until March 3, 1885, when Helen Curtis purchased it from the Commonwealth of Massachusetts. The land had been sold previously by the Commonwealth at a public auction and, presumably, either the Curtises were the successful bidders or acquired the right to purchase the land from the successful bidder. Click here for an index to the deeds for 253 Marlborough. James Curtis died in January of 1888. 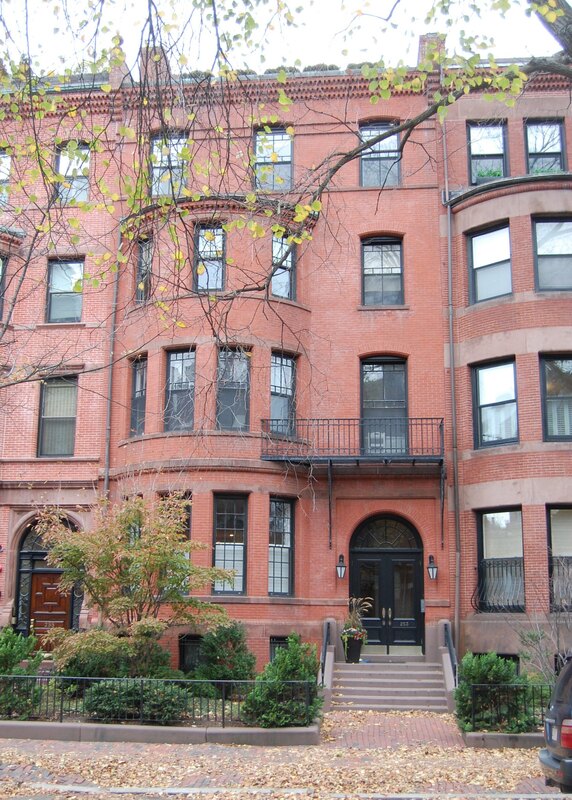 Helen Curtis continued to live at 253 Marlborough and also maintained a home in Prides Crossing. In the early 1900s, Helen Curtis was traveling abroad. During the 1900-1901 winter season, 253 Marlborough was the home of retired merchant Melancthon Woolsey Borland and his wife, Julia (Gibson) Borland. They previously had lived at the Hotel Victoria at 273 Dartmouth. Julia Borland died in April of 1901, and M. Woolsey Borland moved soon thereafter. By the 1902-1903 winter season, he was living at 445 Marlborough. During the 1901-1902 winter season, 253 Marlborough was the home of attorney Charles Fry and his wife Maria (Burnham) Fry. They had lived at 21 Commonwealth in 1900 and were living there again by 1903. 253 Marlborough was not listed in the 1903 and 1904 Blue Books, but by 1905 it once again was the home of Helen Curtis and her unmarried children, Francis Gardner Curtis and Mary Curtis. Francis Gardner Curtis was assistant curator in Chinese and Japanese art for the Museum of Fine Arts. Francis Gardner Curtis married in April of 1913 to Mary Winchester Barnard, and they moved to 27 Brimmer for the 1913-1914 winter season and then to 143 Beacon. Helen and Mary Curtis continued to live at 253 Marlborough. Helen Curtis died in May of 1927 and Mary Curtis moved soon thereafter. 253 Marlborough was not listed in the 1928 Blue Book. On April 12, 1928, 253 Marlborough was purchased from Helen Curtis’s estate by Louisa Chapin (Hooper) Thoron, the wife of Ward Thoron. They also maintained a home in Danvers, where they had lived year-round for the past several years (in the early 1920s, they had maintained a Boston home at 294 Beacon). The house was damaged by fire on September 29, 1928, causing damage to the basement and first floor. It was under renovation at the time. Ward Thoron died in February of 1938. Louisa Thoron continued to live at 253 Marlborough until about 1948. On October 5, 1948, 253 Marlborough was purchased from Louisa Thoron by Gardner Read and his wife, Vail (Payne) Read. They previously had lived in Ohio. Gardner Read was a composer, conductor, and musical scholar. From 1948 until about 1978, he was composer-in-residence and professor of composition at Boston University’s School of Music. In February of 1949, the Reads applied for permission to convert the property from a single-family dwelling into a lodging house. In May of 1949, they withdrew their application, noting in a letter to the Building Department that the expense of bringing the house into compliance with fire safety and egress requirements was too great. In January of 1950, they filed a new application seeking to convert the property into two apartments (one in the basement and the other on the first and second floor) and four units for roomers on the third floor (the fourth floor would remain vacant). They once again abandoned the permit. On June 14, 1954, 253 Marlborough was purchased from the Reads by Dr. Jost J. Michelsen, a physician and neurosurgeon. In April of 1954, he applied for (and subsequently received) permission to convert the property into a single-family dwelling and doctor’s office (for his own use). By 1955, he had moved his residence and office to 253 Marlborough. He previously had lived in Winchester and had maintained his office at 412 Beacon. In 1955, he married Mrs. Ruth Hazel (Winebrenner) Scotvold. 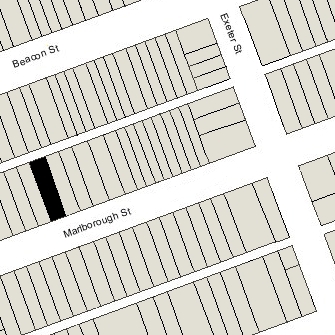 After their marriage, they lived at 253 Marlborough. On June 21, 1956, he transferred the property into his and his wife’s names. They continued to live there in 1959, but moved thereafter to 33 Marlborough. On November 23, 1959, 253 Marlborough was purchased from the Michelsens by Daphne C. Adams, a social worker, who operated 253 Marlborough as Fellowship House, a dormitory for foreign students. Daphne Adams married in the early 1960s to Samir Hanna. On July 30, 1962, 253 Marlborough was acquired from Daphne (Adams) Hanna by Nick Haddad, trustee of the Cook Realty Trust. In December of 1964, he filed for (and subsequently received) permission to convert the property from a single-family dwelling and doctor’s office into ten apartments. On July 8, 1966, 253 Marlborough was acquired from Nick Haddad by Newman Preparatory School. The next month, it purchased 251 Marlborough, and in October of 1966, it applied for (and subsequently received) permission to combine the properties and convert them into a school, which it operated as an annex to its school located at 245–247 Marlborough.